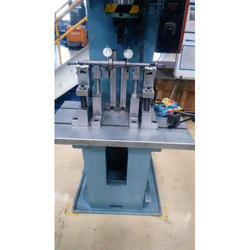 Our range of products include shaft runout checking & straightening fixture. Adjustable type Run out Checking Straightening Fixture on Hydraulic Press. Run out at 2 End Reference diameter will be checked by resting the Parts on Bearing V Rest. Adjustable for Variable Diameter Length. Run out checking arrangement can be adjusted as per diameter requirement. Once the Run out being checked Bend of a shaft can be corrected on the same Fixture with the Help of Hydraulic Press.